The world has a few gruesome sights. Seeing them can make the strongest of bellies ache. One such place is the slaughterhouse. The sight of such a place can change people’s eating habits at times. 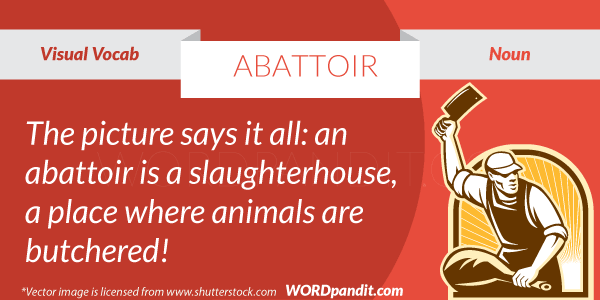 ABATTOIR is that horrible place. It can sicken a lot of people and that’s why we have refrained from putting a direct picture of a slaughterhouse. What is done with animals in a slaughterhouse? They are beaten down to death. 1. The Supreme Court, which had in July 2004 directed shifting the slaughter house to Ghazipur, on Wednesday refused to interfere with the deadline fixed by the Municipal Corporation of Delhi ( MCD) for closure of the British- era abattoir. 2. Two cows had to be rescued by the Coastguard after swimming out to sea when they escaped from an abattoir in Sitra.